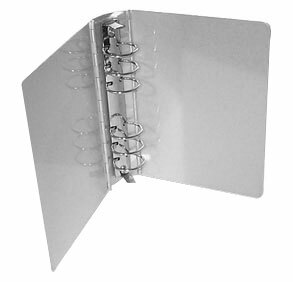 A hybrid 3 ring binder aluminum cover with swing hinge mechanism. The SHP™ advanced 3 ring is KIND to your printed documents. No sheet tear outs, no ring gaps no spring open sheet document ejection when dropped. The aluminum swing hinge design is being revised and will not be available until late summer 2017. A few words about the original swing hinge advanced 3 ring binder development. Unique hybrid NO FAIL swing Hinge 3 ring steel mechanism is available in other cover materials on this website. Purchase just one binder. Original developer of the swing hinge binder did not realize the significance of the unique novel applications of the Swing hinge ring binder. Totally missed its significance. You can see how they missed the the fact that the new ring was a genuine ï¿½game changerï¿½. A quick read of the patent application shows omission of key beneficial benefits to the user. Patent drawing fails to depict the ubiquitous 3 ring binder application. Three ring binder is never mentioned in patent application. Blind to the real market! Patent application language is focused on simple storage looseleaf binders. Understandably so since the McBee Binder companyï¿½s primary business application for over 50 year was to simply bind way bills and freight tariffs for the railroad industry. McBee invented rudimentary binding machines. Royal McBee Corporation was named as the assigned owner of the patent. The corporationï¿½s primary business model was not developing leading new ring binder products. Royal McBeeï¿½s annual sales strategy was focused on growing its key financial Keysort and one write check systems. Royal McBee Corporation had a brief moment in the sun with the popularity of its early computer the LGP-30. It was new and uniquely priced to be affordable for most educational institutions and small industrial firms. Despite this success it had difficulty repeating it with subsequent machines and the Royal McBee Computer Corporation was sold. Obviously they were spending their time and resources in 1957 on computer development and unable to recognize the game changing application of the swing hinge binder. Large capacity ring binder ( RR and D) lose their engineering efficiency as the ring capacity grows. At 1-3/4 inch of paper documents and above the ring actually damages your valuable document. The problem with large capacity ring binders is mechanical interference of the ring and text sheets. Simply opening and closing the covers puts pressure on the paper documents, holes elongate becoming egg shaped and tear out. Now you may have a book with no beginning or ending. Not Good. for an important manual in control room of process plants such as a nuclear generating station. Only about 4 to 6 % of binder users really need the game changing features of this unique novel swing hinge hybrid ring binder. It was difficult to identify the true prospects and much marketing missed the target. In 1965 display ads were placed in the Wall Street Journal. Wasted advertising dollars. Spitting into the wind. The swing hinge languished, barely caught on because it needed to be demonstrated by a trained binder specialist. The national sales force was dismissed. Original plant at 424 N Cedarbrook Ave, Springfield, Mo was shuttered. 250 plus jobs. Gone. Technology is rapidly changing every business. Paper is not the first choice for disseminating information. Old business models are crumbling before your eyes.. 85% of all binder manufacturers have closed. An ï¿½electronic death rattleï¿½ is affecting many businesses as Amazon absorbs the profitability of the few remaining.